The small print at the top of the seat tube decal says, "AN EPOCH-MAKING COUNTRY BIKE". In a minor way, I suppose it is already true. 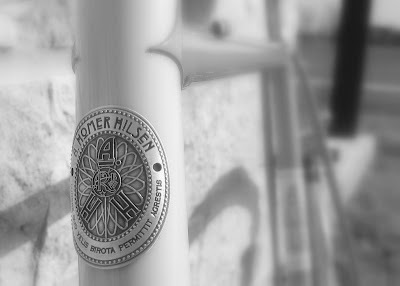 I've admired the look of their bikes and the general philosophy of the folks at Rivendell Bicycle Works for several years. After trying many of Grant's suggestions and finding them useful, I now own a Rivendell bicycle. 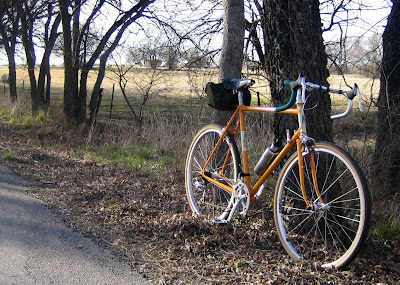 Living on the gently rolling plains in rural Denton County, Texas and riding on low-traffic county roads of the paved and unpaved variety, a Rivendell designed specifically to be a "country bike" seemed like a good idea. Unloaded, it is reasonably light and nimble, but it can easily be fitted with racks and carry stuff for the occasional S24O or tour. Most days, it will simply have a small bag of some kind to carry a few items for a day's outing. The 650B tires provide ample volume for rough, rarely maintained roads and the frequent stretches of gravel encountered. A. Homer Hilsen here seems to have promise. 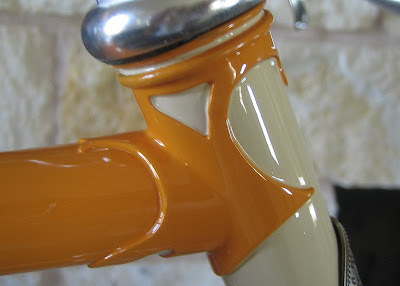 I'll fix the bar tape and provide a more detailed review (and photos) soon. Then we'll see if Homer will live up to his "epoch-making" promise. 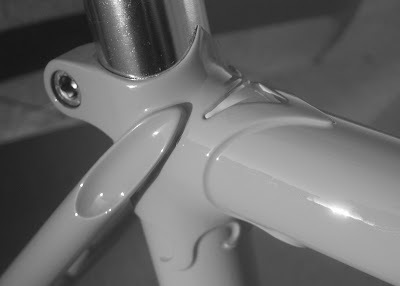 No matter that I've added the rear brake and rear derailleur. No matter that I told him that the remaining parts would be here Monday. No matter that only cables, chain, and bar tape remain and I promised to finish the build Monday night. He wasn't satisfied. The sun peaked through the clouds for a few minutes and Country Boy here nagged until he was outside in the fresh air. Great. That was just the kind of encouragement he needed. Now he will be a relentless nag as I attend to other things around the house. He wants to ramble down some county road so bad, he's straining at his fancy lugs. Well...as you might notice, this is NOT the project bike. This is the old bike, but there have been a few changes. The faithful Kogswell has sacrificed his saddle for the good of the project. The worn out bar tape has been replaced. There might be a few other refinements yet to come here, but this bike is, thankfully, in service. The new frame is all but hurling verbal abuse. He is anxious to get on the road. 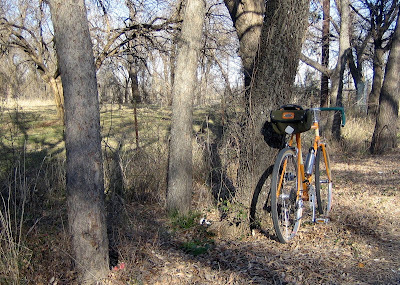 Country bike that he is, living in Denton County, he is in his element. Well, if I'd hurry and finish-up, that is. 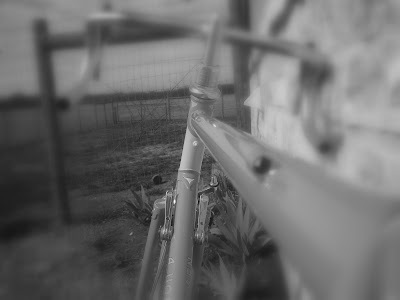 Strictly speaking, hanging on a work stand in my living room is NOT the place for a country bike. All I can say now is that the decisions have been made and last of the parts should arrive in a handful of days. Hopefully, they will all fit together well and not challenge my limited wrenching skills. If that happens, the country bike might just lose the last of his patience and give me an old fashioned whuppin'. Pedaling uphill is immediately apparent. 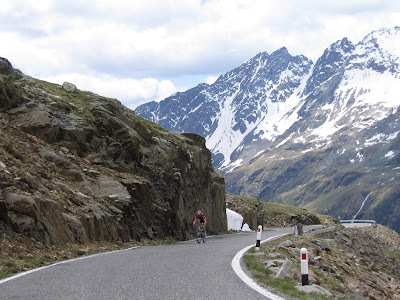 The sudden increase in effort is much more vivid to the cyclist than is the visual landscape. It has been said that one doesn't fully appreciate his topography until he bicycles across it. The same efficiency of motion that helps the cyclist move so easily across flat ground also aids Mr. Gravity as he tugs downward against more lofty causes. So climbing with the bicycle is far from incidental. It is absolutely deliberate. Put another way, if you are coasting, you aren't getting any higher. Mr. Impatient is still not satisfied. He doesn't have time for my puttering or my incompetencies. I might argue that things have been happening, but they aren't really very visible. 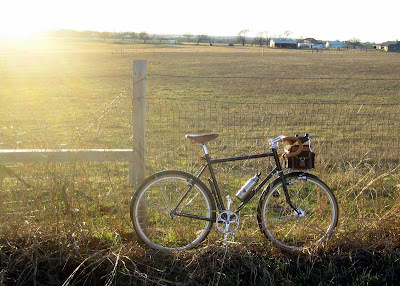 I might explain that a slower pace will allow me to get things just right and help me avoid slapping things together for the sake of just getting on the road. He should understand THAT. In the end, I suppose what I've been doing is puttering around. As he'll tell you, it really is about time I make a few decisions, order a few last parts, and finish this project up. It leers at me with disdain. Obviously impatient, it wonders if I'm worthy...or whether I even know what I'm doing. It waits for attention, while I am otherwise occupied. The project bike is a work in progress. Unfortunately, because I've been slammed with the flu, my body is also a work in progress. Still trying to regain strength, I struggle to catch up at work. Because I'm working with a budget, and trying to use parts from other bikes, there are still a few build issues to resolve.